Claiming Jeter was overrated became a cottage industry of sorts to the point that it became “smart” to say he was actually underrated because of all those who said he was overrated. The truth is that both sides were right. Jeter had a penchant for the highlight defensive play, but advanced stats indicate he was probably a sub-par fielder. Was he especially clutch? Well, he is a career .309/.377/.439 hitter in the regular season and a .308/.373/.465 hitter in what amounts to nearly a full season of postseason games. His numbers with two outs and runners in scoring position, when the game is close in late innings, or in “high leverage” situations are all similarly good. Jeter was good in the “clutch” by being just as good as he was at other times. You can use statistics to show Jeter is not an all-time great, as Olbermann does. But a writer for the same company used stats to show Jeter is an all-time great. With Jeter, it’s about more than stats. He played in the Steroid Era and is the last position player anyone would suspect of using PEDs. * He lived in the Twitter/TMZ Era and never had even a whiff of a scandal. (He slept around but never married, so no harm there.) In the 2008 All-Star Game at Yankee Stadium that lasted 15 innings, Jeter was pulled in the sixth inning; his Yankee teammate Alex Rodriguez was replaced in the fifth. My dad was at the game and remembers A-Rod disappearing from the dugout and Jeter staying and cheering his teammates until the end. *I can’t say last player because Greg Maddux would surprise me even more than Jeter. On the heels of teammate Mariano Rivera’s farewell tour last season, yeah, I’m sort of exhausted by the Jeter coverage. And so I choose not to pay attention to most of it. But I can’t say it’s not deserved. I was at Citi Field when the Yankees visited this season. I knew it would be the last time I’d see Jeter in person, so I booed him extra hard in his final at-bat. It was a different type of boo from what I’d give A-Rod or, say, Jimmy Rollins. I disliked Jeter because he performed well against my favorite team and was the face of a team I really didn’t like. He never provided any bulletin board material for opposing fans. He just hit. There are many reasons why Jeter is the preferred player for a generation of Yankee fans. But even the die-hards don’t claim he’s the best ever. 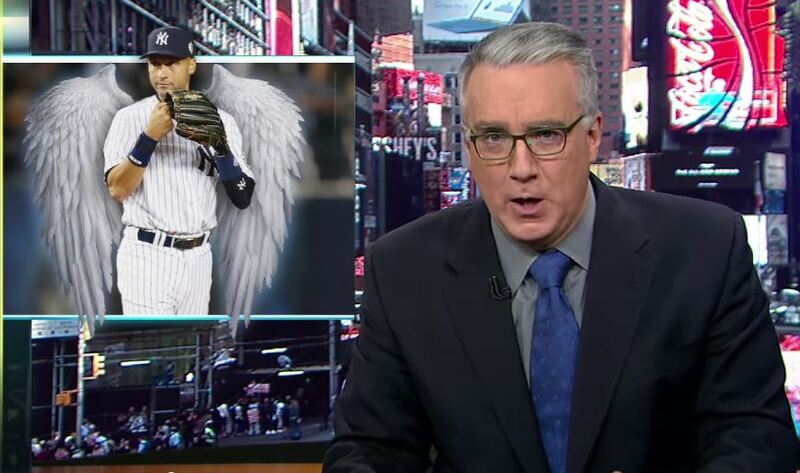 There’s trolling, and there’s Olbermann: taking a contrarian stance for the sake of attention. Previous PostCollege Football Week 4 RapNext PostWhy Did ESPN Suspend Bill Simmons?